World time zones. Click for larger view. This is a list of countries, regions, and territories grouped by time zone. 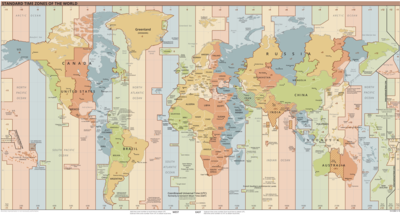 Although many time zones have descriptive names used by people in them, they are least ambiguously identified by their relationship to UTC (Universal Time, Co-ordinated). UTC used to be called GMT (Greenwich Mean Time), after the Royal Observatory located in the Greenwich area of London. UTC is also sometimes called Z or Zulu time. A time may be written as e.g. 21:45Z with the Z indicating UTC. The "Z" is for "zero", and "Zulu" is the two-way radio pronunciation of "Z". It comes from the nautical system in which each time zone was assigned a letter. Your "body clock" may experience some stress as you "tell" it to meet business appointments, tours and other obligations perhaps a few or several hours different from the hours you normally rest. If starting the reverse course by midday, you may, in a way, travel back in time, as you land earlier than you started. For example a typical flight from Sydney to LA will take off at lunchtime and land early in the morning on the same calendar date! This also occurs for short flights from an earlier to a later time zone, for instance from Minsk to Warsaw, though in those cases you will generally arrive less than an hour before you started. In different parts of each time zone, sunrise and sunset can occur at vastly different times than you might be used to. So it might be a good idea to check sunrise and sunset times for the time of year you'll be travelling to your destination. Jet lag is a mismatch between your body clock and the local time wherever you are. It's caused by rapid travel across time zones, and compounded by the fact that long hours spent on a plane can cause you to sleep too much, or not enough, possibly at the wrong time. Flights from east to west, where you gain a few hours, are usually a bit easier, as most people find it easier to stay up a little later than to go to bed earlier. A rule of thumb is that you recover about 1 hour difference per day. You may find that on your way out, you are fine after just a couple of days, but you will really notice the recovery period on your way home. At that point your body clock will be really confused and it will take a while for it to sort things out. You can aid the process a bit by trying to operate on your new local time as early as possible, and spending the daylight hours first few days in your new time zone outdoors. If you're going to land early in the day, try to sleep on the plane so you arrive refreshed and ready for a full day of activity. Conversely, if you're going to arrive near the evening, try to stay awake on the plane so that you'll be tired when you arrive and can get a lengthy sleep. In many jurisdictions, local time is set forward by an extra hour in summer to "shift" daylight hours to the end of the day. This is known in the UK as British Summer Time (BST, GMT+1) and almost anywhere else as Daylight Saving Time (DST) or (name of local time zone) Daylight Time. As can be seen on the map above, some time-zones seem to defy logic and were mostly drawn by national or regional governments to make commerce and administration easier. This can have strange consequences, most notably in the case of China which "should" span five time zones but for political reasons observes the same (Beijing) time in all its territory. To complicate matters, in the restive province of Xinjiang, Beijing time is used by ethnic Han, but UTC +6 is used by ethnic Uyghurs. Departure times of long distance transport are given in one time zone (usually that of the departure point, although the Trans-Siberian railway had long been run on Moscow time throughout Russia). Sir Sandford Fleming, inventor of time zones, was a railway man as rail travel was the advance that made standard time zones necessary. Some railways published schedules with disclaimers like "all times are X time" even before time zones legally existed. Stations sometimes had a clock showing railway time while the town hall or church showed a different "local time" a few minutes off. The time zones (and the International Date Line) often snake around political boundaries; Chicago lags a full hour behind Thunder Bay because the latter is on Ottawa's side of a provincial boundary. There's a 21-hour time difference between the Diomede Islands, a mere 3 km (1.9 mi) apart but separated by the International Date Line. Visiting the Aroostook Valley Country Club? By the time you get to the 19th hole, you may be wondering where that extra hour went... as the clubhouse was built in New Brunswick as a measure to circumvent Prohibition, putting it an hour ahead of the same course's pro shop in Maine. Another odd time-zone border lies in Europe where (also mostly due to political reasons) going west from France lets you stay in the same time zone (when you should have to change from Central European time to UTC or even UTC-1) but going north from France to Britain you will have to change time-zone. Daylight Saving Time can further complicate this. Born as a wartime energy conservation measure, the adoption of DST is inherently political and its abolition (as proposed by the European Union for 2019) just as political. Most tropical countries see absolutely no need for DST, keeping standard time year round. Southern Hemisphere countries have opposite summer and winter to the Northern Hemisphere. There is no universally agreed point of the year to change from standard to daylight saving time, leaving wild leaps and fluctuations where one country has already changed and the other has not. Sometimes, one country makes a political decision to start daylight savings time early during a conflict or an energy crisis; the US did this during the 1973-74 oil embargo, leaving the Thousand Islands briefly in two different time zones and disrupting TV/radio broadcast schedules. If you travel during that time or call home, inform yourself of the local time at both your destination and point of origin. A handful of time zones differ from UTC not by full hours but by (usually) some other multiple of 15 minutes. North Korea adopted UTC+8:30 briefly (which differs from South Korea's UTC+9 by half an hour) only to drop it just as abruptly during a 2018 thaw in relations; both moves were deemed political by some. Newfoundland island (UTC-3.5, summer UTC-2.5) differs from its neighbours St. Pierre and Miquelon (UTC-3 year-round), Cape Breton (UTC-4, summer UTC-3) and Blanc Sablon (UTC-4 year-round); continue into Labrador and Newfoundland time returns, only to fall back to Cape Breton's time zone somewhere between Red Bay and Cartwright. China: While China should geographically be in several time zones the Central Government has declared Beijing time to be official in all of China even as far west as Tibet. While this makes travel a lot easier, it leads to sunrises at 09:00 and other strange things. Brazil: Brasilia, Rio, São Paulo, Fortaleza, Maceio, Recife, Salvador, etc. Canada (Atlantic Time): New Brunswick, Nova Scotia, Prince Edward Island, most of Labrador, a small portion of eastern Quebec. Québec does not use Atlantic Daylight Time. Canada (Eastern Time): Nunavut, most of Ontario, most of Quebec. This zone runs from Anticosti (63°W) past Thunder Bay (so westward to 90°W), to include most of Canada's population and the entire beaten-path Windsor-Quebec corridor. United States of America ("Eastern Time"): Maine, New Hampshire, Vermont, Massachusetts, Connecticut, Rhode Island, New York, Michigan except extreme northwestern counties, Indiana except the southwest and northwest corners, Ohio, Pennsylvania, New Jersey, eastern Kentucky, West Virginia, Virginia, Washington, D.C., Maryland, Delaware, eastern Tennessee, North Carolina, Georgia, South Carolina, Florida except western part of panhandle. Canada ("Central Time"): Manitoba, Saskatchewan except for the region around Lloydminster, part of north-western Ontario. Saskatchewan does not use daylight time, except in Lloydminster. United States of America (Central Time): Wisconsin, Illinois, the southwest and northwest corners of Indiana, western Kentucky, western and middle Tennessee, Mississippi, Alabama, Minnesota, Iowa, Missouri, Arkansas, Louisiana, north and east North Dakota, eastern South Dakota, middle and eastern Nebraska, most of Kansas, Oklahoma, most of Texas, part of western Florida(panhandle). Mexico: Baja California Sur: Chihuahua, Nayarit, Sinaloa, Sonora. No Daylight Time in Sonora. United States of America (Mountain Time): southwest North Dakota, western South Dakota, western Nebraska, a sliver of Kansas, Montana, a sliver of Oregon, southern Idaho, Wyoming, Utah, Colorado, Arizona, New Mexico, a corner of Texas. No Daylight Time in Arizona, except for the Navajo Nation. This travel topic about Time zones is a usable article. It touches on all the major areas of the topic. An adventurous person could use this article, but please feel free to improve it by editing the page. This travel guide page was last edited at 15:54, on 5 March 2019 by Wikivoyage user Mx. Granger. Based on work by Wikivoyage users Lachlb, K7L, ShakespeareFan00, SelfieCity, Ypsilon, Ikan Kekek, Ground Zero, Hobbitschuster and Toran107 and others.